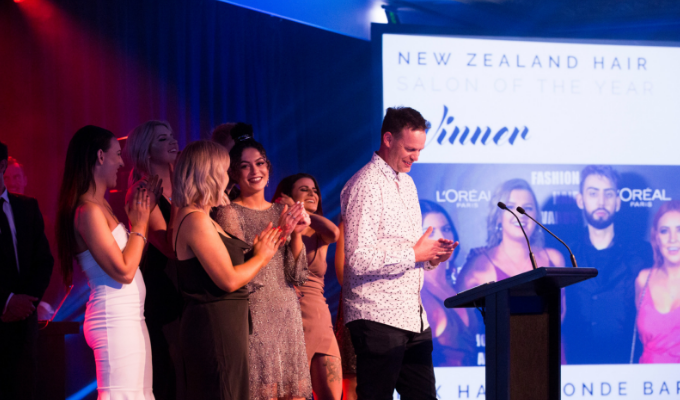 The 2018 New Zealand Hair Salon of the Year award was won by Hamilton based salon Fox Hair Blonde Bar. We spoke with owner Dave Rogers about his win at The Industry Awards 2018. 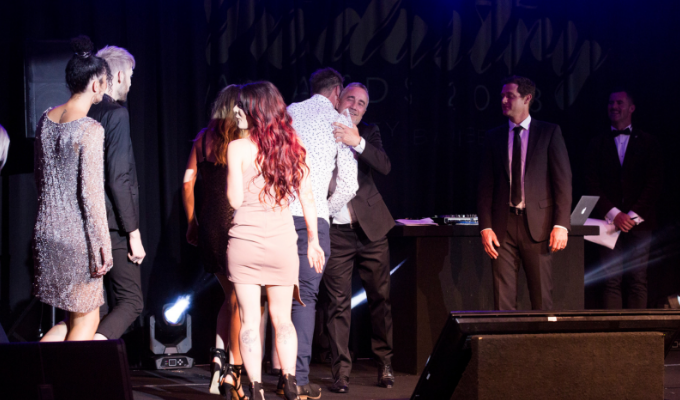 How does it feel to be the New Zealand Hair Salon of the Year? For me it’s an amazing feeling and I’m really really proud that we’ve won this award. It’s confirmation that we’ve got the right team, we’re on the right track and all the hard work has been worth it. Winning this award is actually something we set out to achieve as a team 18 months ago, so it’s such a good feeling. But this award is really all about the team. They really deserve to be recognised for their amazing work. What I think has made us successful is the team. At the end of the day what is done on the floor and walks out of the salon is fantastic, and that’s what makes you successful. They embody what the salon is all about, they absolutely love what they do and they’re so good at it. The quality and consistency of work is second to none. You’re privileged if you have one or two superstars in your salon, but we’ve got a whole team of them. That’s unique and I’m speaking from experience when I say that. I’ve also had the benefit of being in this industry for many years and owned a few businesses, so I’ve made all the mistakes there is to make and learnt from those. I also have to mention how lucky I am to have my fianće in all of this, I couldn’t do it without her support. What is Fox Hair Blonde Bar all about? I worked with Redken for many years and became aware of prices charged for blonde colour and products. When I first purchased the business I knew it had a great location but it was really underperforming and we had no idea what to do with it. But really this amazing business opportunity was sitting right in front of me. So the vision is to be the best at producing blonde hair in New Zealand. We focus on quality and consistency and the brand is fun – after all it’s a fun market to be in. What do you believe your salon offers clients? First and foremost it’s quality. We also make our clients feel like they’re part of something special and different. Our clients are also very similar to our team to and that’s really important. I’m very driven and have a strong work ethic. That combined with being competitive, I’m always wanting to do better and that really underpins everything I do. I’ve also got dreams and over the past couple of years I’ve been given a number of opportunities which have also really motivated me and helped me achieve them. I’m also never that satisfied. I’m always striving to do better and I guess that can be my downfall. That’s why The Industry Awards are amazing because they make you sit down and reflect. I’ve now taken the time to appreciate how far we’ve come and the success we’re experiencing. Also what motivates me is seeing other people enjoy their work and seeing them excel. In 2019 there will be a bit of consolidation and fine tuning going on because it’s been so full on and we’ve experienced a lot of growth. It’s really all about cementing the performance, normalising where we are right now and looking at our businesses in more detail. Fox has had an even better year again this year, so we’ll be back at the awards in 2019 too – I want back-to-back wins! How do you feel entering The Industry Awards has helped you as a business owner? 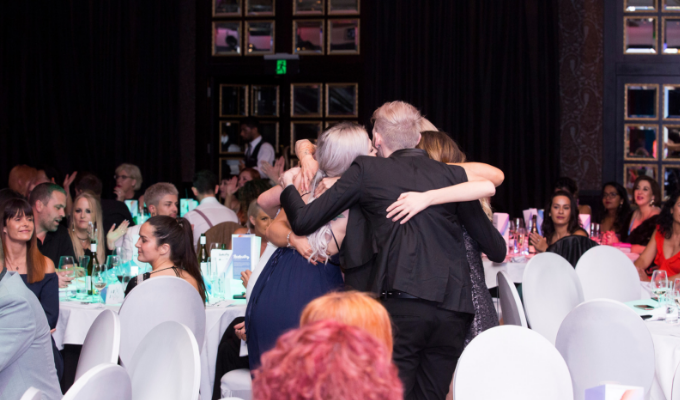 The format of the New Zealand Hair Salon of the Year award is perfect as it looks at all the areas that need to be healthy in order for your business to succeed. So it’s the perfect opportunity to have a really in depth look at your business. We got so much out of it and it’s such a great tool and health check. In fact even if you don’t win it gives you the opportunity to celebrate what you’re doing well and shows you which areas you need to focus on and improve. Do it would be the first thing! There is so much to be gained from it even if you don’t become a finalist. It should also be a process you undertake every year anyway as you should regularly be having a good look at your business. I also want to encourage everyone to enter, don’t doubt yourself or wonder if you can win. You never know how others are doing and what market conditions are like, so you don’t know where you’ll fit in to this – you could surprise yourself. Get your culture right and the KPIs will follow. Everything comes back to what’s happening on the floor. If your team love coming to work, if they understand your vision, then the KPIs are a result of that. We certainly look at our numbers a lot, but it all comes back to culture and team.